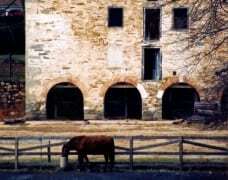 The Bussard Farmstead, a well-preserved example of a Montgomery Co. farm at the turn of the 20th century, is located within the 455-acre Agricultural History Farm Park. 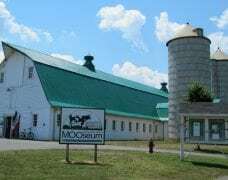 Past farming practices are interpreted in an historic farmhouse, large frame bank barn, assorted farm buildings, and a modern activity center. A Montgomery Parks site. 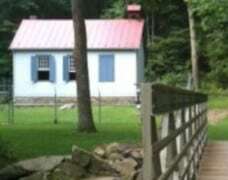 Park is open year round: Brussard Farmhouse is open for special events. Call or check website for details. The Beall-Dawson House was constructed in 1815 as a residence for the Beall family; it is furnished in the style of the early 19th century. The Stonestreet Museum of 19th-Century Medicine, c. 1850, is the outfitted office of a country doctor. 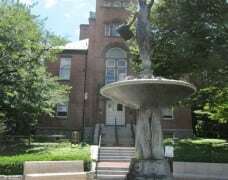 The site is also home to the Montgomery County Historical Society and its Jane C. Sween Research Library. Admission fee. Note: Beall-Dawson House is closed July 20 to October 8, 2017 for installation of a new exhibit. 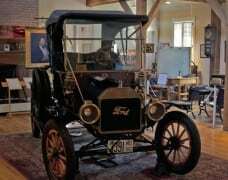 Stonestreet Museum is open Thursday-Sunday, 12-4pm. A 630-acre natural area park with grand views of the Potomac River and C&O Canal. 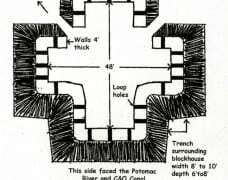 The site includes historic Civil War ruins of an 1852 Union outpost camp and blockhouse used to guard the Potomac River crossing from Confederate attack. Many existing trails are part of the historic Civil War complex for which the park is named. The trails are remains of the transportation system that furnished materials and supplies to the troops stationed here. A Montgomery Parks Archeology site. Park is open sunrise to sunset. Call for details on guided hikes. 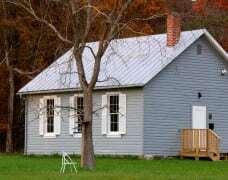 This one-room schoolhouse has been renovated and restored to its appearance in 1900. The 22’x30’ wooden structure was the only public school for African Americans in the Boyds area from 1895-1936. Owned and operated by Boyds Historical Society. Open the last Sunday of the month, 2 to 4pm, April through October; for special events; and by appointment. A living history center depicting plantation life of the enslaved in the 1850s and the story of the Underground Railroad. Reconstruction-era barn, historic outbuildings, heirloom garden, heritage breed farm animals, and slave cemetery. Work continues to restore and maintain the historic buildings and preserve the cultural landscape as a resource for education, preservation, and heritage. Home to the Menare Foundation. Open for self-guided tours Saturdays, June through November, and by appointment. 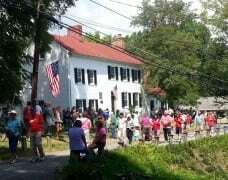 The home Clara Barton, the founder of the American Red Cross, for the last 15 years of her life. Originally a Red Cross warehouse building constructed in 1891, it was remodeled in the “Steamboat Gothic” Victorian architectural style and became Clara Barton’s permanent residence and national headquarters of the American Red Cross in 1897. She occupied the house until her death in 1912. A National Park Service site. Currently closed for extensive renovations. 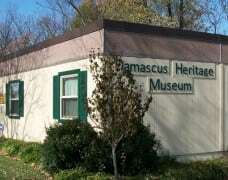 The Damascus Heritage Society was established in 2005 to preserve the unique agricultural, educational, economic, social, and spiritual history of the Damascus community. The museum opened in 2009 and features changing exhibits, an annual community “Tea,” lecture series, and special events. Edward’s Ferry, a busy canal town dating to the early 1800s, was located at a popular crossing point on the Potomac River of particular significance for troops during the Civil War. Lockhouse 25, built in 1830, interprets the area’s Civil War history. 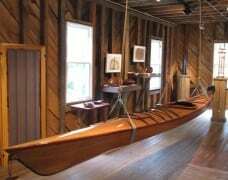 It is open for special events and available to reserve for overnight stays through the C&O Canal Trust’s Canal Quarters program. A site in the C&O Canal National Historical Park. Open daylight hours, year round. 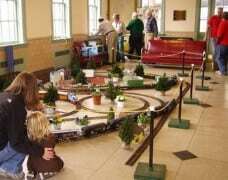 Located in the restored 1884 B&O Railroad station complex, exhibits feature local and transportation history. The site was placed on the National Register of Historic Places in 1978 and includes the historic Freight House, outdoor History Park, and rolling stock – train engine (1918) and cars (1950s). 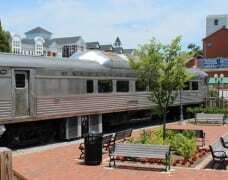 A City of Gaithersburg facility. Tuesday-Saturday, 10am to 3pm, and by appointment. Built in 1899 and in use until 1982, the Observatory was one of six around the world that measured the Earth’s wobble on its polar axis to aid in navigation. Data collected is still used for GPS purposes today. Located in a small neighborhood park, the gated site is open for special events. A City of Gaithersburg facility. Call or email for facility hours. Built in 1922, the old bank building has a walk-in vault and period safe deposit boxes, and exhibits on Germantown history. 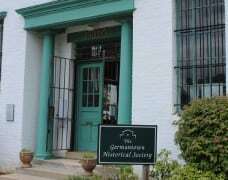 The site is operated by and home to the Germantown Historical Society. 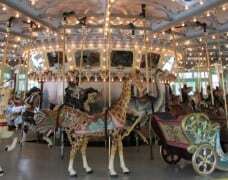 Glen Echo Park is a lively visual and performing arts site dating back to 1891. Initially home to a Chautauqua program dedicated to providing the “masses” with opportunities for education and recreation, by 1900 the site had become a popular amusement park, in operation until 1968. Part of the National Park Service since 1971, Glen Echo Park Partnership for Arts and Culture, Inc. oversees art, history, and recreation programs in a unique setting. Park grounds are open 6am to 1am daily; check website for detailed operating hours and calendar of events. Glenview Mansion, included on the National Register of Historic Places, is located in the 153-acre Rockville Civic Center Park. 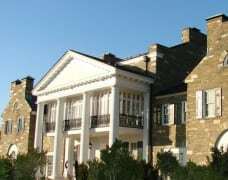 The core of the house was built in 1838; the current structure was completed in 1926 and includes an art gallery, historic displays, meeting rooms, and formal gardens. 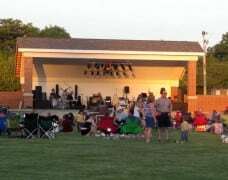 The Civic Center Park offers nature trails, picnic grounds, playgrounds, tennis courts. Owned and operated by the City of Rockville. Monday, Wednesday & Friday, 8:30am to 5pm; Thursday, 9am to 9pm. The C&O Canal National Historical Park was established in 1917 as a 184-mile National Park Service site. The Visitor Center, located beside restored Lock 20, was built in 1828 as a lock tender’s house and later converted to an inn. 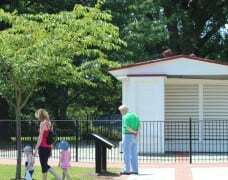 It houses interactive exhibits on the history of the park. Rides on a mule-drawn 1870s packet boat ($), check website for seasonal schedule. Wednesday through Sunday, 9am to 4:30pm. 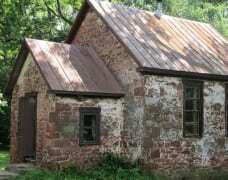 Built in 1870, the cabin was relocated in 1976 from a post-Civil War African American community north of Poolesville. Life of newly emancipated African American families in the late 1800s is interpreted on this site that also includes a number of outbuildings. A Montgomery Parks site. The Hyattstown Mill was reconstructed in 1918 after a fire destroyed the original structure dating to the 1790s. Located in Little Bennett Regional Park, the mill is currently home to a wide variety of arts-related programs and activities sponsored by the Arts Project. The Mill is generally open weekends from 10am to 4pm. Check website for special and regularly scheduled events. 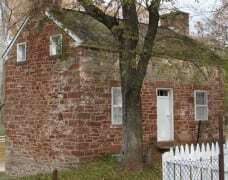 The John Poole House, the oldest building in Poolesville, is a one-room log trading post built in 1793 that was enlarged several times; in 1810 it served as the area’s first post office. The general store museum is historically furnished based on early records and includes exhibits and a museum shop. The adjacent E.L. Stock, Jr. Memorial Arboretum features trees, bushes, herbs, and perennials indigenous to pre-1850 western Montgomery County. A property of the Historic Medley District. The site is open by appointment, and other days by chance. Please call ahead to be sure that it is open. Site of the historic Riley Farm where Rev. Josiah Henson lived and worked as an enslaved person from 1795 to 1830. Rev. Henson’s autobiography inspired Harriet Beecher Stowe’s landmark novel, Uncle Tom’s Cabin. 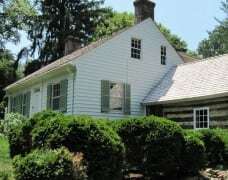 A wood frame, two-story house dates to 1800-1815 with an 1850 log wing; both portions were remodeled in 1936. 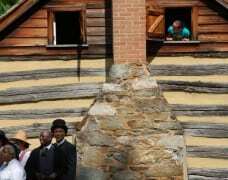 A Montgomery Parks site and part of the National Park Service National Underground Railroad Network to Freedom. 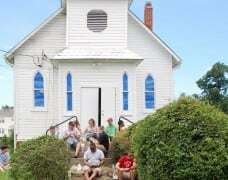 This 1893 one-room schoolhouse served local children ages 6-12 until 1935. It is being refurnished to its 1920s appearance based on oral histories from former students. A Montgomery Parks site in Little Bennett Regional Park. Guided tours the 1st Sunday of the month, 1pm to 4pm, April-October. Check website for parking information. Located in the Washington DC office of the American Latvian Association in the Latvian Evangelical Lutheran Church, the collection has been donated by Latvians who immigrated to the U.S. after World War II. Exhibits provide an overview of Latvian history and culture from prehistoric times to the present. 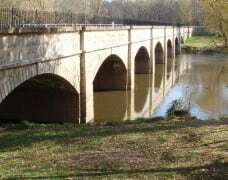 Built in 1833, this grand, seven-arched, 500-foot aqueduct carried the C&O Canal over the mouth of the Monocacy River. Part of an important transport system for troops and materials during the Civil War, it withstood multiple Confederate attacks. 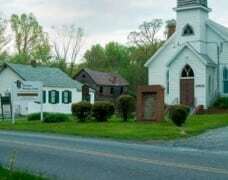 Established in 1747 as the Anglican “Chapel of Ease” or Monocacy Chapel, the small church was virtually destroyed by Union soldiers during the Civil War and rebuilt by Daughters of the Confederacy in 1915. While the cemetery’s earliest graves date to the mid-1700s, it is also the burial site for many fallen Confederate soldiers. 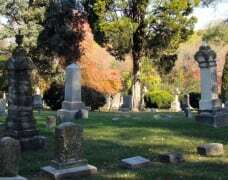 Cemetery is open year round. 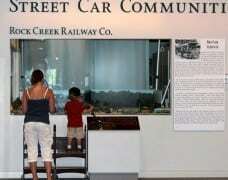 Established in 1959 to preserve and interpret the history of area electric streetcars, the renovated Visitor Center features exhibits on streetcar history, a display of historic trolleys, and a model of streetcars and street life in Chevy Chase in the 1930s. Ride vintage streetcars on a 2-mile track through Northwest Branch Park. Admission fee. Saturday and Sunday, noon to 5pm; check website for weekday hours. Part of the historic Oakley Farm dating to the mid-1700s, Oakley Cabin was one of three structures in an 1800s African American roadside community housing farm laborers and tenants. The small cabin is now a museum illustrating the area’s history. A Montgomery Parks site. The park is open sunrise to sunset year-round. 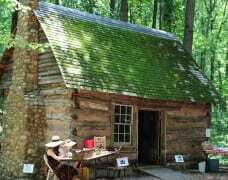 The cabin is open the 2nd & 4th Saturdays of the month, noon to 4pm, April through October. Built in 1910 as a bank building with a beautiful walk-in safe, it later became the Poolesville Town Hall. The museum offers rotating community and history exhibits. A property of the Historic Medley District. Open for special events, call for information. Founded in 1938, Olney Theatre was known as “the South’s first professional summer theatre.” Today the award-winning regional theatre offers diverse productions as well as extensive apprenticeship and educational outreach programs at its historic 14-acre campus. The Pleasant View congregation in Quince Orchard was established after the Civil War, erecting its first church structure in 1888. 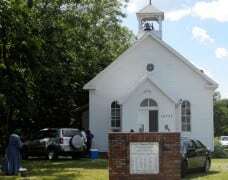 The site is home to the former Quince Orchard Colored School, Pleasant View Methodist Episcopal Church (1914), and Pleasant View Cemetery. Completed in 1891 in the Romanesque Revival style, the Courthouse served all functions of local government for 40 years. 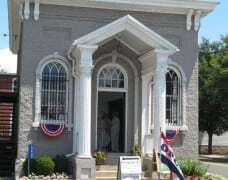 It is now home to preservation organization Peerless Rockville while still serving as a working County courthouse. The Red Brick Courthouse will be closed for unexpected building repairs during June and July, 2018, with anticipated reopening on August 1. Peerless Rockville: Monday-Friday, 10am to 3pm, and by appointment. Established in 1981 to preserve the Sandy Spring community’s history, the museum opened in its current location in 1997. Its exhibit hall, of post-and-beam construction, is reminiscent of barns and outbuildings of historic Quaker farms. 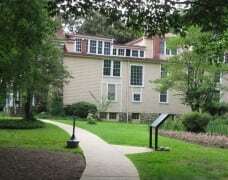 The museum houses exhibits and a research library and offers programs in the visual, literary, and performing arts. Admission fee. The museum’s Great Hall houses an extensive collection of historical art and artifacts telling the stories of African and African American history. A cross section of a clipper ship, African hut, and log cabin are also on site. The museum is open for special events and by appointment. A scenic aqueduct and lock along the C&O Canal; Riley’s Lockhouse dates to 1830. Park open daylight hours, year round; lockhouse open for special events. The Schoolhouse was built in 1865 by community members using Seneca sandstone and operated as a one-room schoolhouse until 1910. A trained and costumed teacher teaches a carefully researched school group program on a typical school day in 1880. A property of the Historic Medley District. Open year-round for scheduled school field trips; visit their website or call for details. Constructed in 1945 on the foundation of the original 1878 station, the historic building’s interior, with waiting room and ticket counter, has been meticulously restored to its original appearance. The station was added to the National Register of Historic Places in 2002. A Montgomery Preservation, Inc. site. An historic 1893 African American church and cemetery. St. Paul was the heart of the Sugarland Forest free black community established in 1871. Open for special events and by appointment. This historic town known as the “U.S. 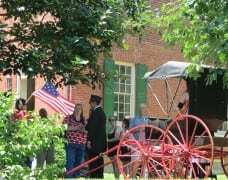 Capital for a Day” for its role during the War of 1812 includes the Brookeville Academy (circa 1810) and Madison House (private residence), the oldest section of which dates to 1798. Call for information; self-guided walking tour available on website. Located in the heart of the 93,000-acre Agricultural Reserve, Poolesville’s 200+ years’ history includes Civil War sites while its proximity to the Potomac River and the C&O Canal National Historical Park provides a favorite destination for bikers, hikers, and day-trippers. Weekly guided hikes, April through October, and by appt. Check website for details. Trail open dawn to dusk for self-guided tours. This unique African American site dates to the 1860s and is a rare location retaining the three anchors of the historic community – church, school, and benefit society hall. Dating to the 1790s, the Waters House is home to Heritage Montgomery and offices of Montgomery Parks. A unique cable ferry in operation since 1786. A popular crossing point for troops during the Civil War, it was known as Conrad’s Ferry until being renamed after Confederate Col. Elijah Veirs White. 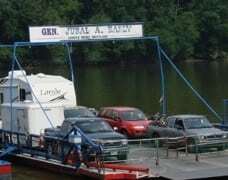 The automobile ferry crosses the Potomac River between Poolesville and Leesburg, Virginia every 20 minutes. 301-349-5200 and Historic White's Ferry on Facebook. The ferry operates daily 5am to 11pm, weather permitting. An 1832 three-story stone bank barn is home to the visitor center with exhibits and audio-visual programs interpreting the themes of Quaker heritage, 19th-century agricultural practices, life during enslavement, free black communities, and the Underground Railroad. (See also Underground Railroad Experience Trail Hikes above.) Woodlawn Manor Cultural Park also features an early 1800s brick manor house and several out buildings. A Montgomery Parks facility. Admission fee. Visitor Center open Wed. - Sun., 10am-4pm, April thru November. Grounds are open year-round, sunrise to sunset; manor house open for special events.